On the 17th of July, 2015, Ant-Man blasted onto the silver-screen, where we finally met the smallest hero of the Marvel universe. Although he's a major part of the Marvel comics, he's still unknown to a lot of average movie-goers. To catch you up and learn more about the Ant-Man lore, we have listed the top 9 things that you should know about Marvel's Ant-Man. 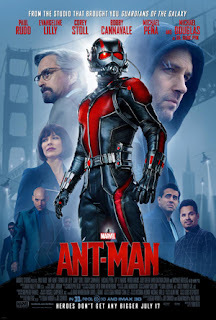 1) Three characters have donned the Ant-Man costume in the comics. Hank Pym, who invented the suit, was the first. He was replaced by Scott Lang, and then by SHIELD Agent Eric O’Grady. 2) In the comics, Hank Pym was the original creator of Ultron. Because he used his brain waves for Ultron’s A.I. programming, they share the same personalities and intelligence. 3) Hank Pym has changed his superhero identities several times. First he was Ant-Man, then he became Giant-Man, Goliath, and eventually, Yellowjacket. In the movie, Yellowjacket will be the villain of the Ant-Man, to be played by Corey Stoll. 4) Hank Pym is a scientific genius with a Ph.D in biochemistry and nanotechnology. His expertise in quantum physics led him to the discovery of ‘Pym Particles’ that enabled mass to be shunted or gained from an alternate dimension. 5) Janet Van Dyne, Pym’s wife, took on the identity of the Wasp using the technology of Pym Particles. She used the particles to graft wings on her back which appears when she shrinks. The costumed Wasp was seen on the filming location of Ant-Man, but no specific actress was cast for the role. 6) Shield Agent, Eric O'Grady, is often called the Irredeemable Ant-Man. He mostly uses his powers for his selfish ways, and rarely does his job as a hero, much to the disappointment of Hank Pym. 7) The Falcon (played by Anthony Mackie) is shown in the trailers to appear in Ant-Man. Although his role in the plot of the movie is still unknown, it is assumed that he will appear in the film to recruit Ant-Man in the Avengers initiative. 8) Patrick Wilson plays Daniel Cross’ cousin, and is planned to become the villain Crossfire in the future movies. 9) Using the Pym Particles, Ant-Man doesn’t just shrink in size, he's also able to grow as large as he needs to. Hank Pym used this ability while he took on the identity of Giant-Man and Goliath.